Iranian Minister of Information and Communications Technology says the “toughest sanctions ever” imposed on Iran by the US government clearly violate the most basic human rights of Iranian people, including their right to development. In an address to the World Summit on the Information Society (WSIS) Forum in Geneva on Tuesday, Mohammad-Javad Azari Jahromi said the unilateral sanctions imposed on certain states is a prime example of human rights violation and serves as an impediment to sustainable development. “So, the international community needs a mechanism to prevent certain states from using their development technologies as a tool to impose their will on others,” he said. Azari Jahromi added the current sanctions imposed by the US on Iran deprive Iranian citizens of receiving services provided by the global suppliers. “This hampers the Iranians’ investments in the IT area and impedes their online businesses,” he said. He then expressed Iran’s readiness to establish cooperation with all members of the international community particularly its regional neighbours to prepare the ground for further business to business (b2b) and business to customer (b2c) communications in Western Asia and beyond. He also added that despite all challenges, the Islamic Republic is determined to press ahead with its projects. The minister then said sustainable development deals with a responsible and efficient government and added through developing electronic government, the Islamic Republic has been seeking to establish accessible, efficient, transparent and responsible entities in public sector. “At present, Iran offers electronic services in 201 public sectors and 734 specialized electronic services in various areas from judiciary to agriculture, health and culture,” he noted. According to the Iranian minister, 44 government bodies including the Central Bank, Police and so on offer GSB services. He then maintained that peace and sustainable development are interconnected and that closing our eyes to each of them will lead to insecurity in the world. 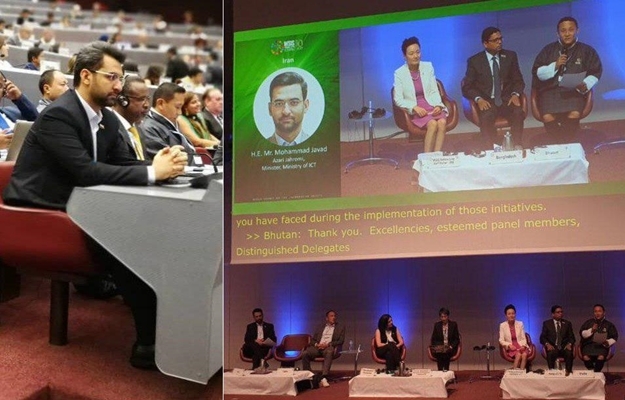 World Summit on the Information Society (WSIS) Forum is a global United Nations (UN) multi-stakeholder platform facilitating the implementation of the WSIS Action Lines for advancing Sustainable Development Goals (SDGs). It provides an opportunity for information exchange, knowledge creation and sharing of best practices, while identifying emerging trends and fostering partnerships, taking into account the evolving Information and Knowledge Societies.